As the SNES bandwagon rolled into the nineties, all indications were Nintendo’s 16-bit prize-fighter was set to run away with the console race, leaving SEGA in desperate need of a title that could define their Mega-Drive system. Rather improbably, the answer to their prayers came in the form of a speedy blue hedgehog. 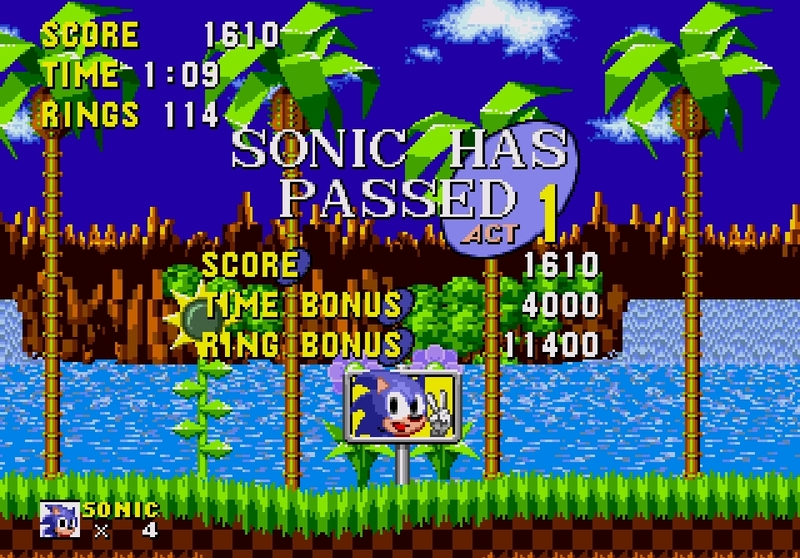 Sonic the Hedgehog proved a watershed moment for SEGA; not only a marketing dream, but a game that reflected their ethos of championing stylish, arcade-friendly output during the period. Thus the stage was set for Mario and Sonic, and the platform genre more generally, to dominate the small-screens of gamers into the early nineties, the two figureheads appropriately showcasing different qualities. Where Mario was substance, Sonic was accessibility. Where Mario had craft and precision, Sonic offered style and dynamism. 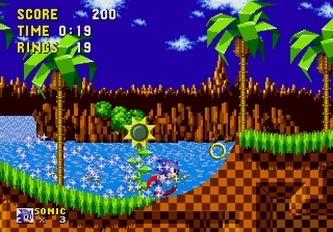 Without question, Sonic The Hedgehog was most significant game SEGA ever released, and whilst it could be argued the series’ glory days extended little further than the Mega Drive’s own lifecycle, it’s a pleasure to be reminded of a platformer that was lively, creative, superbly-designed and at the time, quite unique to play. One thing that forever jumps out at the player upon booting up Green Hill Zone is the undiminishing, distinctive beauty of the game. This is down in significant part to its massive scrolling backdrops, which seem to go on forever, showing off bright skies and waterfalls filling vast glistening oceans of a lush utopia. 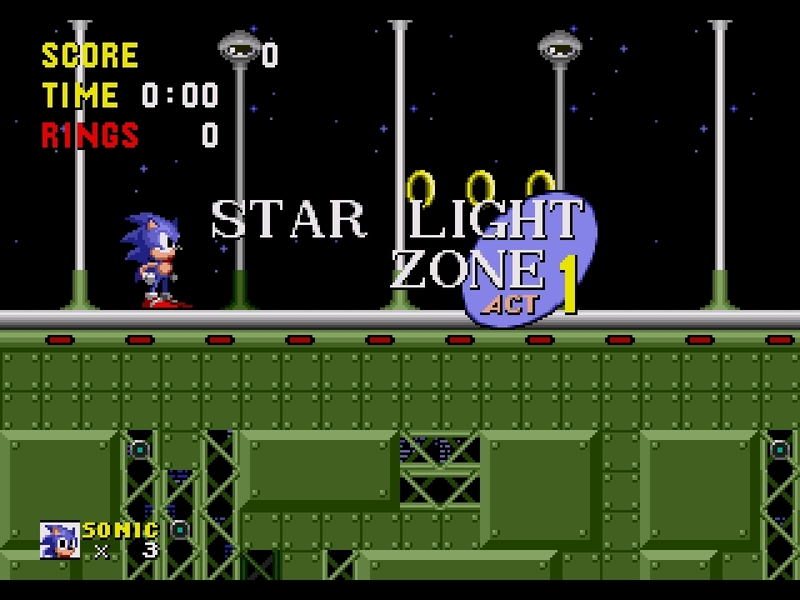 Whilst they perhaps become a little less extravagant as Sonic the Hedgehog progresses towards the more mechanically-minded Star Light and Scrap Brain zones late on, there’s no question they bring the game to life. There’s no clutter, no dodgy digitised sprites, just eye-popping colour permeating every stage. 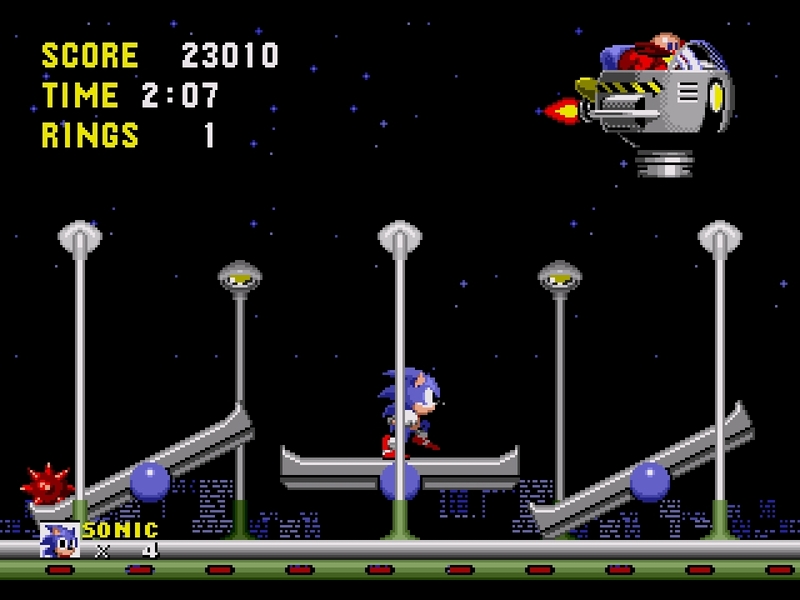 The Sonic sprite, with its array of great animations, is magnificent, and all the more impressive when you consider how well the mix of control and speed is gauged. 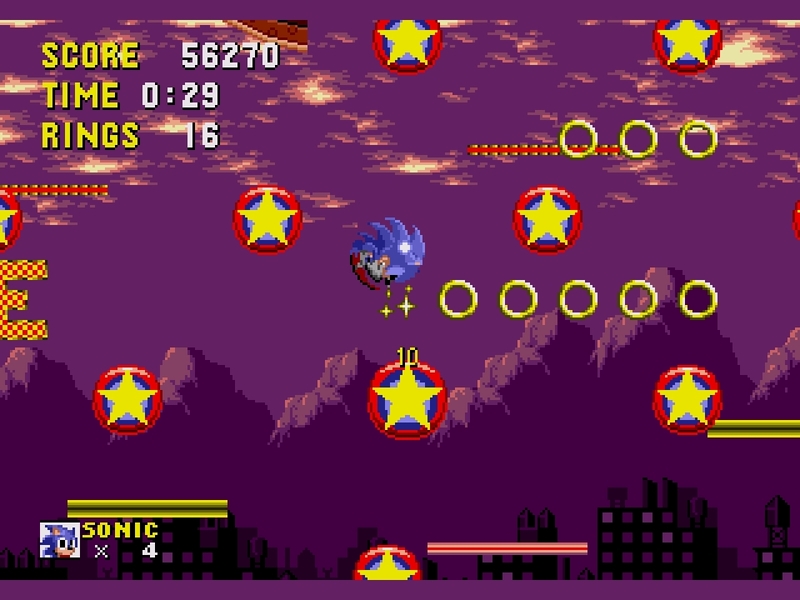 The series has never been more at home than when Sonic is charging along, legs and sneakers a blue and red blur, as he loops corkscrews at bonkers speeds. It sounds great too. 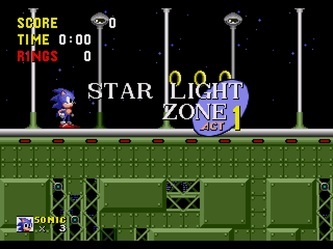 The title screen and boss music are quintessentially Sonic, but then, you could make a case that most of the themes are. Bubbly, jazzy, infectious and totally brilliant, the short accompaniments may be a tad repetitious, but they’re a joy to listen to, and are duly matched by the crisp ring collecting sound effects and the satisfying ‘pft’ of jumping on, and vanquishing, an enemy. It’s easy to take for granted some of the game’s ideas, many of which were pioneering in the platform genre in 1991. Collecting rings, for example, was unconventional in the extreme, and yet made for a user-friendly alternative to meting out punishment through health bars and lives. 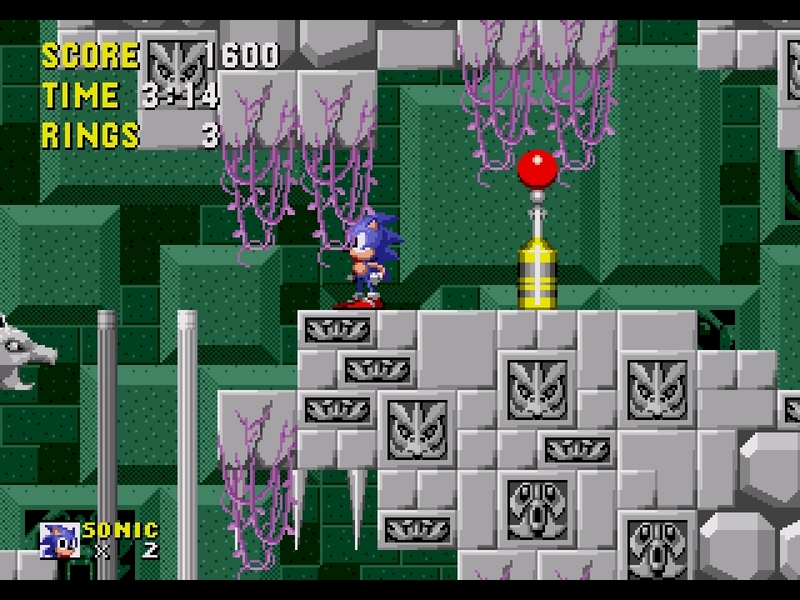 When Sonic gets hit by an enemy or hazardous bit of scenery, the rings he has collected scatter everywhere, forcing the player to scamper after them in a vain attempt at salvaging a few before they vanish. From the point of view of survival, they’re essential, as being hit without any rings costs the hedgehog a life. 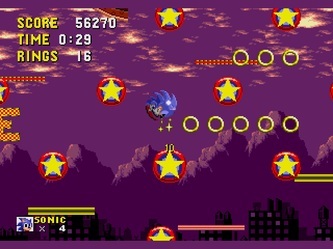 They’re a source of prosperity as well as protection however; reaching one hundred results in an extra life, whilst retaining a high number at the end of a stage results in the player being transported to a fancy, pinball-esque bonus stage where you have the chance to grab a Chaos Emerald. This in turn leads to another unusual facet for a platformer of its time; the game’s proper conclusion is only revealed following the collection of all emeralds, which gives completists a fair bit to work at. Each level, consisting of three stages and a boss fight, remains a triumph of divergent themes and challenges. 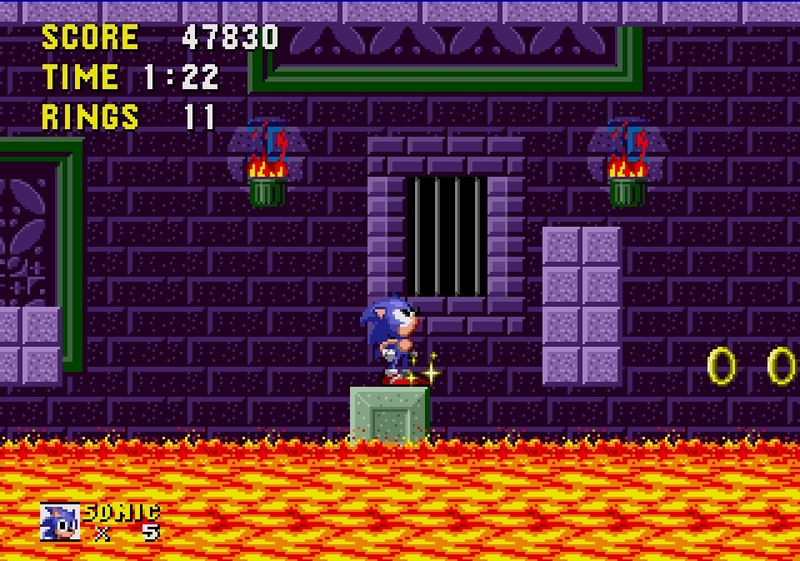 Green Hill forms the template to the majority of opening levels in the series, whilst Marble Zone sees a sequence of hold-your-breath moments that involve deftly staying out above the vast expanses of lava within the mountainside. Spring Yard comes third, acting as a sort of prototype to the pinball antics in Sonic 2’s awesome Casino Night stage (and later Sonic Spinball), and though its stages are guilty of recycling challenges, Spring Yard is craftily designed to show off the marvellously elastic physics, positively delighting in pinging Sonic around pinball-style buffers and rocketing him up and down ramps. It gets better: Labyrinth Zone is a remarkable sequence of pre-Lara Croft tomb-raiding that sees a seamless mix of on-land and underwater platforming, with Sonic’s movement becoming slower and more deliberate in aquatic surrounds, his already-springy jumps being elongated further. Of course, no matter how cool a hedgehog is, he can’t breathe underwater forever, and is tasked with gulping in oxygen bubbles at regular intervals, so as to avoid a countdown and the famously dread-inducing music that accompanies it, the source of many a gamer’s nightmare back in the early nineties. 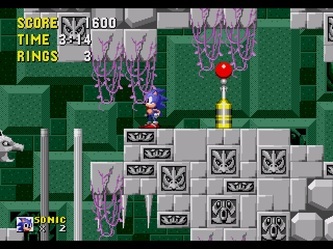 The levels often featured several tiers and therefore not only a bit of variety, but also a sense of freedom, something quite liberating in a game so fast. The beauty of it is, you could rocket through the levels at a million miles per hour, or you could play meticulously, finding hidden routes, rings and bonuses, and it’s just as good either way. 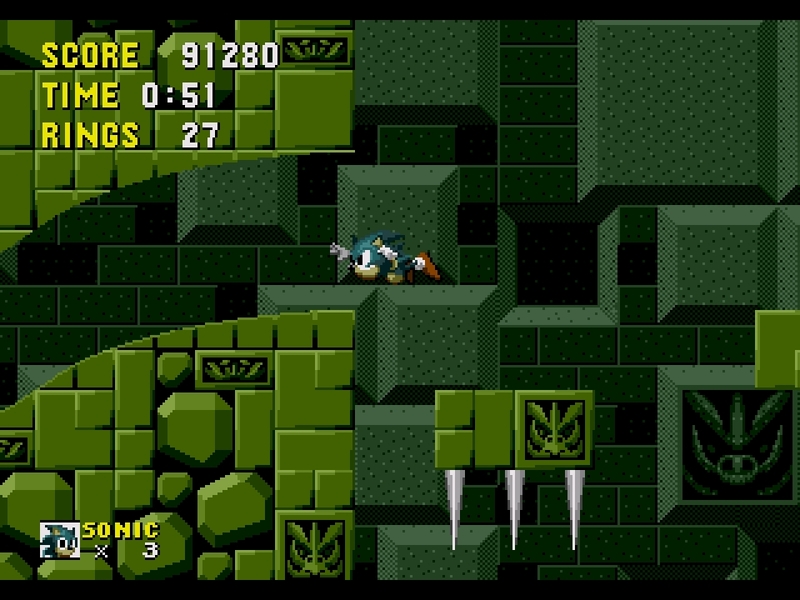 Not forgetting of course, the villain to the piece, Dr. Robotnik, is a boon too. 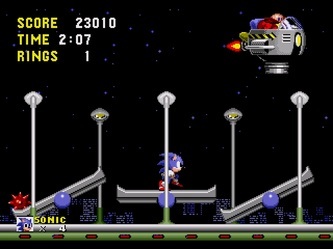 Turning up in his flying contraption and villainous music at the end of every zone, whether he’s trying to kill Sonic with a giant wrecking ball, burning him, drowning him or removing the ground from under the hedgehog’s feet, Robotnik’s moves could generally be countered with a bit of thought, but were marvellously entertaining. Barring the painful last act to Scrap Brain zone, something of a non-sequitur with scenery and underwater bits making it feel like a spare Labyrinth stage, the game is a gentle enough challenge for most players to conquer after a few goes. Sonic 2 would expand on the formula with beefier levels, greater lasting appeal and a useful, spin-on-the-spot move that might have spared a few awkward moments if it had have been present in the original, but it’s hard to grumble too much about a platformer that is so universally appealing. 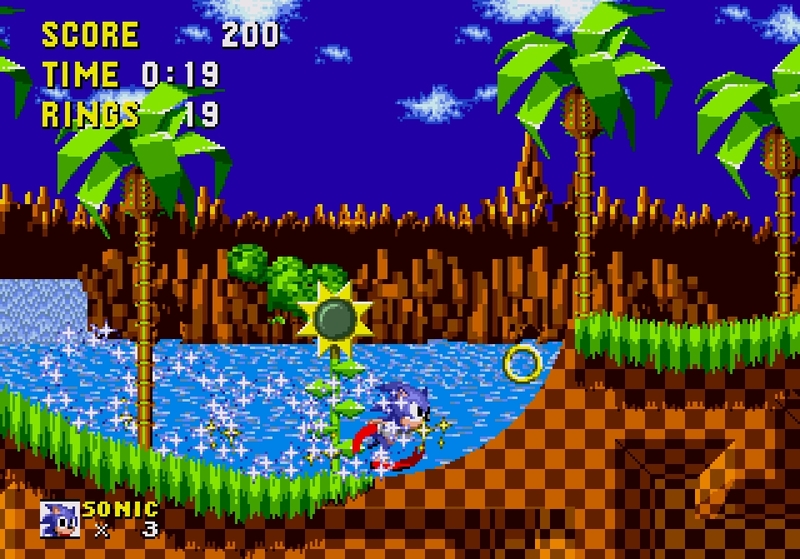 Certainly, it may have played on its cool-factor upon release, but with nineties ‘rad-ness’ long since a distant memory, what keeps a fresh generation of gamers coming back to Sonic, whether it’s on a phone or as part of a retro compilation, is that it’s still such good fun to play. Absolutely magic. "Sonic The Hedgehog was the most significant game SEGA ever released... it’s a pleasure to be reminded of a platformer that was superbly-designed and at the time, quite unique to play"